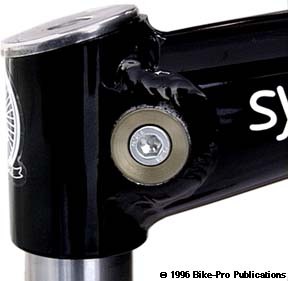 The Cattleprod was among the first of the aluminum mountain bike stem genre, and has held up superbly, as the example of what an aluminum stem should be. Syncros does some serious machine work in the creation of the quill. In the 1" size, a piece of aluminum rod is turned on a lathe to reduce the outer diameter of the inserted quill from 25mm to the precise 22.2mm, the steerer requires. The same piece is bored twice, once from the bottom and again from the top. The top down bore crates a hole 13mm accross to cradle the expander bolt head, narrowing to 8.8mm for the expander bolt to pass through. The bottom up bore, through the center, is 13.5 in diameter and extends 76.2mm and reduces the tubing wall thickness to 4.2mm. All of this work is internal to reduce the overall weight of the stem, and make the quill of one hefty piece of aluminum The extension is made of ovalized aluminum tubing, each end is squeezed slightly in opposing directions, to make a long common joining surface then miter cut so the binder and quill recess into the form of each end of the extension. This provides a long line and broad support for the welds. The binder tube is made from an eliptical extrusion that is drilled through the broad area for the 25.4mm handlebar diameter, leaving a wall thickness of 3mm. The piece is cut to a 2 1/4" length which becomes width when the binder tube is welded in place. The Cattleprod has no means of cable routing, Syncros recommends their Cable Hanger which is discussed in the Brake section of this book. The expander bolt is the Syncros Z-Bolt, with 8mm by 1.0mm thread pitch cold rolled threads. The bolt has a 6mm allen head, is 120mm long and weighs just 27.5 grams with the matching wedge. The binder bolts are made of 4340 cro-moly, heat treated steel with 5mm by .8mm thread pitch. The binder bolt has a 4mm allen head, is 16mm long and weighs 3.5 grams, (it's replaceable with the 18mm long Ti bolt weighing 2 grams). The wedge is made of extruded, then machined aluminum, which is drilled and tapped. The Cattleprod is made of 6061 T6 heat treated aluminum. It is available in a polished un-anodized Silver finish or painted a glossy Black with fused surface, electrostatic, powder paint. The word for the stem is exceptional. The Cattleprod is available in 110mm, 120mm, 130mm, 140mm, 150mm, or 160mm, in a 1", 1 1/8" or 1 1/4" diameter. It is also available in two rises, a no rise 0 degree version, or a high rise 15 degree model. The Cattleprod in 140mm, Silver, with a 1" diameter weighs 225 grams. The Cattleprod in 130mm, Black in a 1 1/8" diameter weighs 229 grams, and in 130mm Black 1 1/4" weighs 230 grams, (the reason the weight is still so close is the quill benifits from its larger diameter for structure while using a thinner wall thickness - 4.46mm for the 1" / 3.06mm for 1 1/8"). The Cattleprod will hold 22.2mm center diameter handlebars with a shim, or bulged 25.4mm diameter bars without one. 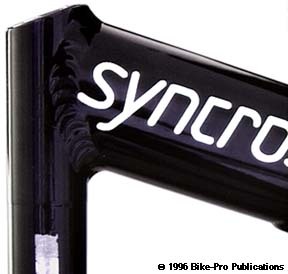 Syncros also makes a road stem they call the "Altura", using the same materials and workmanship as their original Cattleprod. The stem is made of 6061 aircraft aluminum. The quill is made of aluminum rod machined to a 4mm wall thickness. The outside of the quill is turned on a lathe to make certain that it's precisely 22.2mm in outer diameter. The top of the quill has a rear sloping cut, adding contrast to the forward sloping extension. The top of the quill is bored to make a recess and cradle for the expander bolt head. The extension is made from aluminum tubing that is ovalized to make it an "guppy" style, vertical, elliptical shape. The oval extension is TIG welded vertically to the quill. The binder tube, like the Cattleprod's is made from an aluminum extrusion that is turned on a lathe to cut away a narrow eliptical bottom to make the cinch mechanism. The lathe also cuts away part of the lower binder giving the binder tube a flare from the bottom to its full width where it is cut at 1 1/2" long. The front of the binder fitting is bored to recess the bolt head, drilled and tapped for the bolt threads. The binder tube has a 1/2" hole drilled that faces into the extension at time of welding to relieve heat and pressure. The binder fitting lies in the bottom of the elliptical extension, as the binder tube is welded to the extension, then starting at the bottom, the pieces are TIG welded together in one long weld, with a small second one running over the cinch fitting to cover every joining edge. The cinch fitting and binder tube are then sawn through to create the cinch system. The stem is available in an un-anodized high polished Silver, or a high gloss Black using dry electrostatic paint. 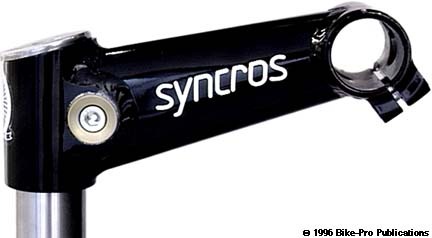 The expander bolt is the Syncros Z-Bolt. It's 120mm long, has a 6mm hex head, with 8mm thread by 1.0mm thread pitch. We can also special order the Altura with Cinelli size 26.4mm inner diameter, to fit Cinelli bars only. 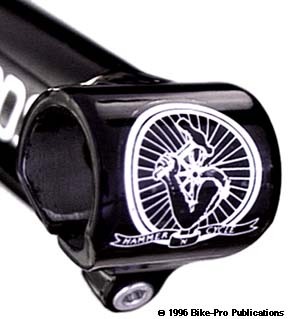 The stem comes in 70mm, 80mm, 90mm, 100mm, 110mm, 120mm, 130mm, 140mm, or 150mm extension lengths. The Altura comes in three stem rises, two are minus rises, -17.5 degree (strada) or a -25 degree (pista) rise, the third is 0 degree (tri-athletic) rise. The weight of a 100mm, -17.5 degree rise Altura is 176 grams. Black or Silver. 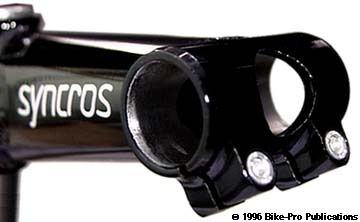 The Ahead Cattleprod is of the few Ahead style stem that doesn't use a rear facing binder type cinch assemblies to hold the stem to the steerer, instead it uses contricting aluminum rods that have a quarter round cut which close down and clamp around the steerer. The extension and double cinch binder tube are the same used for the Cattleprod, the difference is in the "quill" and Ahead cap. The "Ahead" piece that slides over the fork steerer is made of an aluminum extrusion. A 3/4" hole is drilled through the extrusion which will house the constriction clamp. Like the binder tube, this clamp piece is turned on a lathe to make the piece into a cylindrical shape with the excess cut away from the clamp housing. The extension is miter cut to accomdate the rounded clamp housing that fits horizontally into the rear of the extension tube. A single long TIG weld covers every joining edge between the two pieces, securing both together. The clamp pieces are machined from aluminum rod, having an outer diameter just under 3/4" and an approximate 15mm length. One is bored to recess and cradle the clamping bolt head, the other is tapped of the bolts threads to anchor into. The exposed cap piece for this Ahead stem is made of forged aluminum, closing off the top of the steerer and stem. A hole bored into the center of the cap recesses and cradles the head of the steel bolt which holds the cap down, into a, wedge-lock, expansion nut fitting in the steerer. The binder bolts are the same used in the Cattleprod. The clamping bolt is cadmium plated steel with 6mm x 1mm threads, a 20mm length, 5mm hex fitting and a 6 gram weight. The clamping bolt is cad plated steel with 6mm x 1mm threads, a 25mm length, 5mm hex fitting and a 6 gram weight. The Ahead Cattleprod is available in 110mm, 120mm, 130mm, 140mm, or 150mm, in a 1", or 1 1/8" diameter. It is also available in two rises, a no rise 0 degree version, or a high rise 15 degree model in Polished Silver of Powder painted Black. The Ahead Cattleprod in 120mm, Black, with a 1 1/8" diameter weighs 214 grams, and in 150mm, Black in a 1 1/8" diameter weighs 226.5 grams. The Ahead Cattleprod will hold 22.2mm center diameter handlebars with a shim, or bulged 25.4mm diameter bars without one. 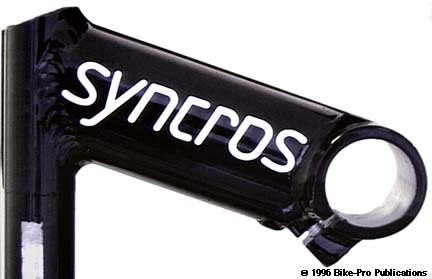 Syncros has revealed to us they are prepared to make an Ahead version of their Altura stem. The only thing holding it back so far has been the number of Ahead road forks in use in the field and the adoption of the Ahead concept more widely in the Road Racing market. It will be made using the Altura extension and single bolted binder, and the 1" machined extrusion, clamping and cap systems used in the Ahead Cattleprod. The inner diameter of the binder tube will be 26.0mm with special orders available in the Cinelli size 26.4mm inner diameter, to fit Cinelli bars only. The stem when it comes to market will have lengths of 70mm, 80mm, 90mm, 100mm, 110mm, 120mm, 130mm, 140mm, or 150mm extension lengths. The Ahead Altura, like the quill version will be made in three stem rises, two are minus rises, -17.5 degree (strada) or a -30 degree (pista) rise, the third is 0 degree (tri-athletic) rise. 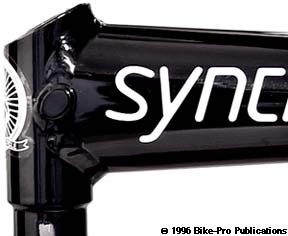 Like all Syncros stems the Ahead Altura will be made in high polished, un-anodized Silver, or electrostatically painted Black.